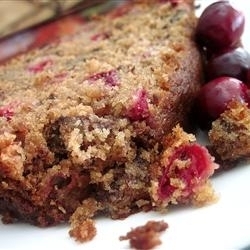 This is a wonderful recipe for cranberry bread. So delicious and moist. I also give you many of my homemade bread recipes including lemon bread, peach bread, strawberry bread and mango bread. So good and so easy to make. PREHEAT oven to 350 degrees. Grease and flour a loaf pan; set aside. Sift the first five ingredients together in a mixing bowl. Now add the beaten and the remaining ingredients. Mix just until moistened (do NOT overmix). Bake for 1 hour. Use a toothpick to test for doneness.